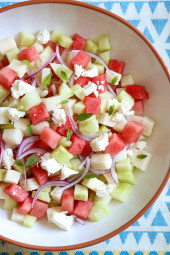 This Watermelon, Jicama and Cucumber Salad is light and refreshing for a hot summer day. 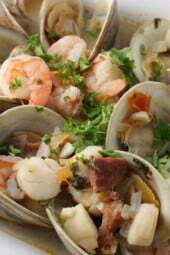 Really quick to put together, a great side for just about anything you put on the grill! With fresh mint, Feta cheese and lime juice, this would be great to bring to a potluck, picnic or the beach. It’s basically summer in a bowl, enjoy! This Watermelon, Jicama and Cucumber Salad is light and refreshing for a hot summer day. A great side for just about anything you put on the grill! 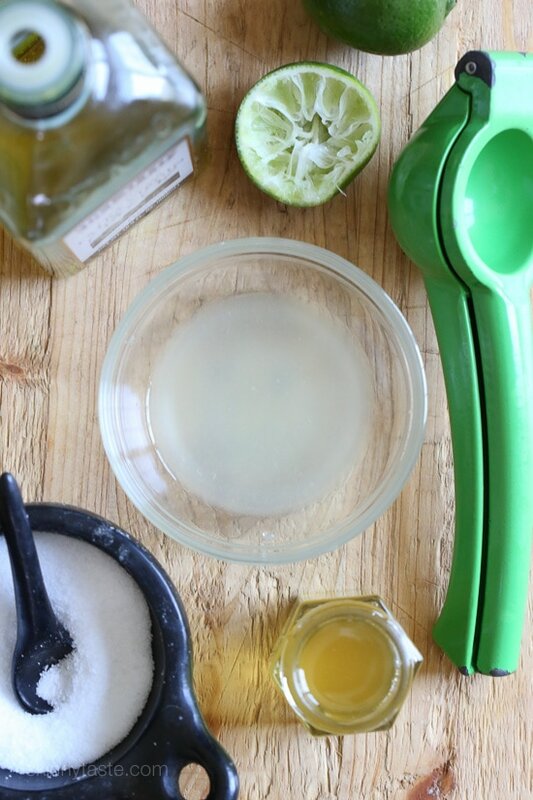 In a large bowl, whisk together lime juice, olive oil, honey, salt and pepper. 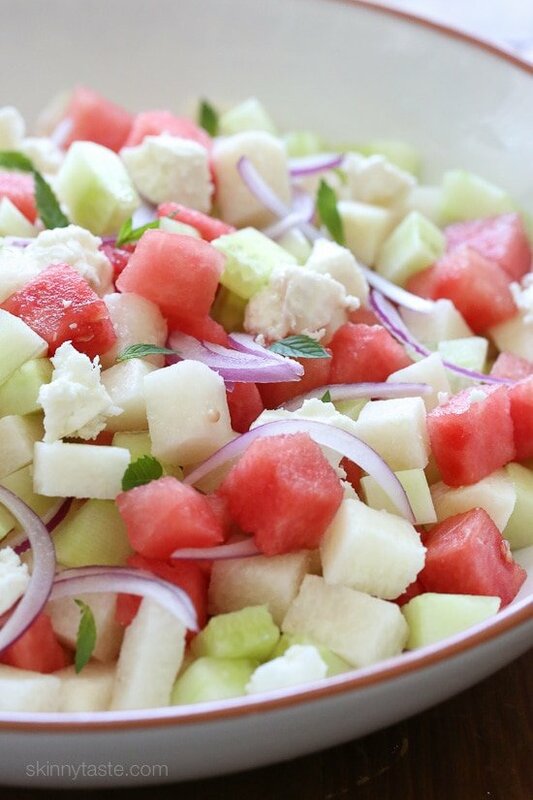 Add the watermelon, jicama, cucumber and red onion to the bowl and toss to coat. Add feta and mint and toss gently. 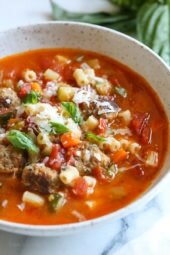 How to save recipes on this site? You can readily find jicama in any produce department. It is slightly sweet and crunchy. Don’t leave it out, it is the star of the salad. This is a delightful summer salad! So fresh and so healthy! Just ate this at my desk for lunch. DELISH! Thanks for the post! Perfect side for my grilled chicken tonight!! Looks good! This is one of my favorite summer salads and I love the addition of another favorite, jicama! We use basil and mint, and I discovered a great orange Muscat vinegar at trader joes that is perfect with this (in place of the lime juice) . You could easily go without the oil even. Thanks Gina, love this. What is jicama? And where do I find it? This looks amazing! Should it be served right away or can it be made ahead of time? Right away would be better. How well does this hold up? I’m thinking of making it and bringing on weekend camping trip. 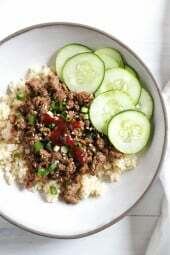 Would it be good to wait to add dressing/mint/feta until right before serving? You can use any honey. Raw is unprocessed. I have never tried it. If you do let me know! I would try honeydew or cantaloupe. Looks delicious, I love fruit in salads. Looks so good! Any suggestions for an alternative cheese? My husband thinks feta tastes like feet…. Try Gorgonzola or Bleu Cheese! I agree with your husband! I like to replace feta with Goat Cheese crumbles. Thanks for posting this. It inspired my supper salad with tomatoes instead of jicama because that was what I had. Very good. Making this today!! So excited to try it! I am not familiar with jicama and not sure where to buy it. Is there a substitute? You can buy jicama in any grocery store Safeway has it.